We know there’s got to be some Angela fans out there. This one is for you. 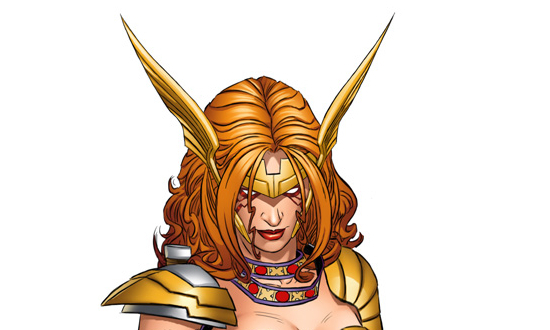 marvel has sent us the debut image of Angela’s new look, created by none-other than Joe Quesada himself. How’s that for a Marvel comics pedigree? She’s one of the biggest new characters to debut in the Marvel Universe in over 20 years, and today Marvel is proud to unveil your first look at ANGELA – redesigned by Marvel Entertainment’s Chief Creative Officer & superstar artist Joe Quesada! Angela, created by New York Times Best Selling writer Neil Gaiman & industry icon Todd McFarlane, makes her dynamic debut into the Marvel Universe this June, in the star studded conclusion to the critically acclaimed event Age Of Ultron with Age Of Ultron #10!